The Komodo Dragon is the largest of the monitor lizards and the largest living lizard. A male Komodo Dragon can grow up to 3 meters and weigh about 70 kilograms. Females are smaller than males. Adults are usually dark grey-brown with patches of yellow, white, green, and black. Juvenile dragons are brighter, with black and yellow spots or bands and reddish spots. Diet in the Wild: Juveniles: insects and small lizards. Adults: birds, rodents, snakes, fish, crabs, snails, and mammals including goats, deer, wild boar and even water buffalo. Much of their food is consumed as carrion. Location in the Zoo: Komodo exhibit near the Herpetarium. Social Organization: Solitary, although several dragons may feed on a common source of carrion. 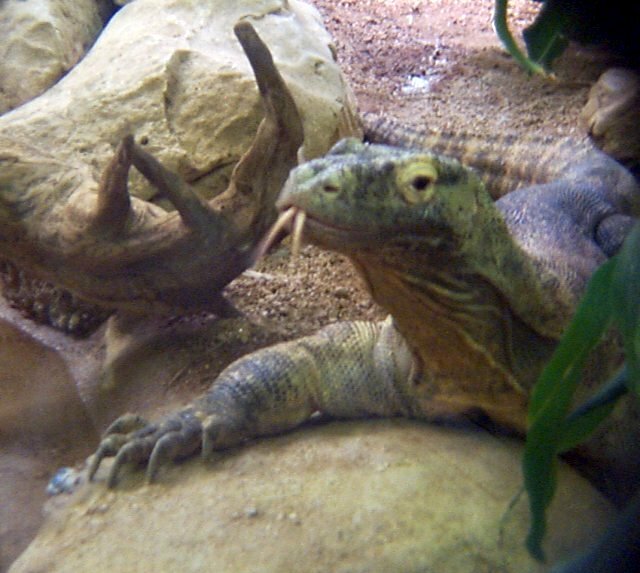 Komodo monitors have a tongue like a snake, forked at the end and very sensitive to taste and scent. Jacobson's organ, a pit in the roof of the mouth, is used to analyze scent molecules collected on the tongue. Comparison of the concentration of molecules on the left and right tip combined with moving the head from side to side, can be used to accurately locate the source of the scent. Komodos can detect carrion at distances up to 4 km. Its legs are large and powerful and it can run up to 20 kph per hour for shout distances. They are also good climbers. However, these big monitors are most effective as ambush hunters, and most monitor attacks do not result in an immediate kill. The bite of a monitor, however, can be deadly due to the presence of many bacteria in the mouth. A monitor bite turns septic and the victim dies in a few days. Its large mouth, strong jaws and big stomach allow monitors to consume food equal to up to 80% of its body weight at a single feeding. Komodos mate from May to August. Males engage in mating combat in which they rear up on their hind legs and wrestle each other. The loser runs or simply gives up. The males court females using mating rituals like as tongue touching, snout nudging, biting, and scratching. Fertilized eggs may be retained in the female until September, when the weather is cooler, and then laid on the ground or in a ground nest "borrowed" bird. The female remains with the eggs until they are hatched, but the babies are on their own and many are lost to predators, including other komodos. Since monitors avoid eating feces, young monitors can protect themselves by rolling in feces. Komodos may live for 30 years. The Fort Worth Zoo is the home of two male Komodo Dragons. The two dragons on an average are about 7 feet in length. They live in a 3,400 square foot indoor/outdoor facility near the zoo's Herpetarium. Komodo dragon. Animal Fact Sheet.